I’m kidding of course. It was most definitely not the “Party of the Year”. Or maybe it is, but only to me. But I think my friends had fun, and I’m glad about that. You see, my high school friends and I used to celebrate our birthdays with each other. Especially J, since her birthday is in the summer. She would invite people over to her house and there used to be 20 or so of us. Now though, everyone else is busy with their own thing and we hardly see each other anymore. We only get updates on each other on Facebook, and that’s just not the same. 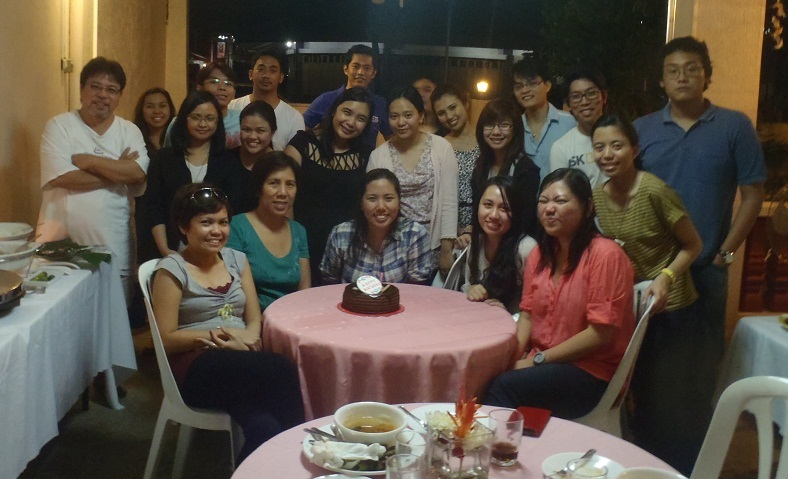 Plus, I miss my former officemates, too. I’m sick of getting jealous, looking at their pictures whenever they all go out with each other. Sometimes I wonder what it would be like if I didn’t quit that job at all. And yet another plus, I had to celebrate my birthday with my current officemates, too. We’ve been inventing so many occasions that it’s nice to have a legit reason to meet each other and be drinking on a Sunday. So really, I just used my birthday this year as an excuse to see all my friends. I would’ve invited more if I could but there were money matters in the way. Sorry about that. Anyway, I had a really fun time. 🙂 It was nice seeing friends I hadn’t seen for a long time, and also those I’d seen less than 24 hours before Sunday night. 😉 And I’m glad they got along. I mean, they mostly did, didn’t they? There weren’t any fights that broke out, and I think people found the games fun. Because yes, there were games. It was really a kids’ party, because you know, I’m in denial of my real age and time is merely an imposed construct anyway. Dinner was inihaw na liempo, barbecue chicken, inihaw na tilapia, pancit bihon, sinigang na hipon and some pichi-pichi from my friend. 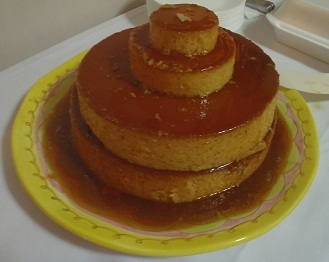 For dessert, we had 4 layers of Leche Flan. Blowing of Candles! 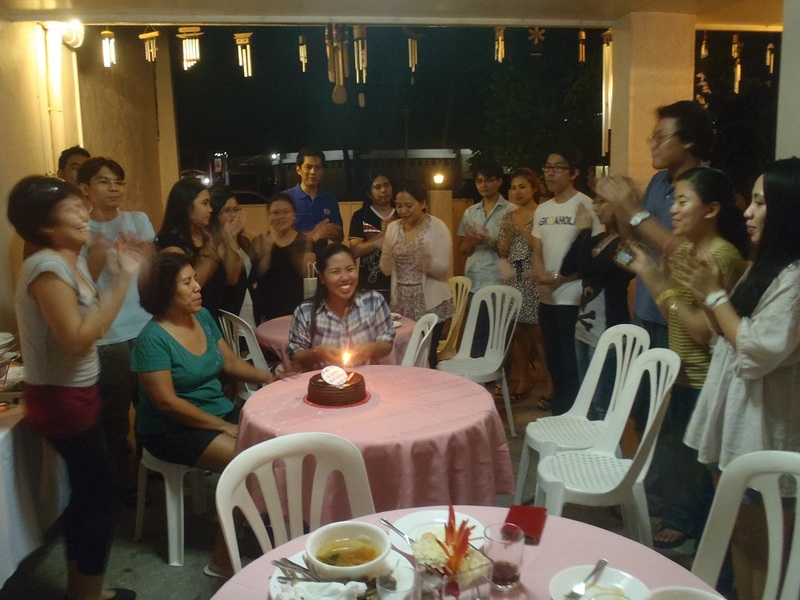 And everyone sang the Happy Birthday Song while clapping their hands. Obligatory Birthday Photo – After blowing out the candle, we pose for a photo. It’s tradition! But you know, this was Sunday night and my birthday was really on Monday. Some of my friends waited until midnight so they could greet me as soon as September 17 came ’round, which was the point of having the party on a Sunday night. I’m so happy my friends made it even though it was Sunday. Because Sundays are usually family days, but maybe my friends and I are close enough that we’re all like family? Haha. Ang senti lang. Anyway, my actual birthday was spent with my family. My parents and I went to a resort in Laguna for swimming, and for dinner, we ate at Sam Won Restaurant in BF Pque. And the waitress remembered me from a meal I ate there 2 weeks ago. What good memory she has. Not that I wasn’t thankful. She remembered what I ordered back then, too, which was exactly what I wanted again this time so ordering was easy. (L-R) Kuya, Papa, me and Mama in the best Korean restaurant in the Metro. At least, according to me and based on my experiences.